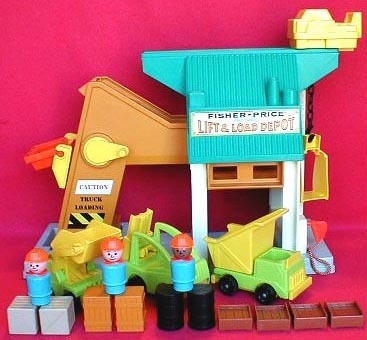 Description: 1977 introduced the first of the Little People Lift & Load series with the #942 Lift & Load Depot. This set broke the mold that all of the previous Little People sets seemed to follow. 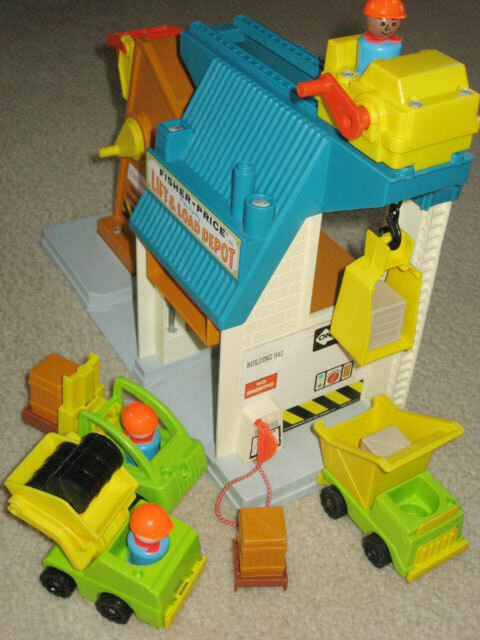 Where most of the previous sets were accessorised with family and/or children figures, the Lift & Load Depot was accessorised with 3 adult construction workers. The base is quite odd-looking, yet very creative in design and structure. One side of the building has an orange crank-operated bucket conveyor that lifts cargo up a slanted ramp, dumps the cargo, then returns to the bottom for more. The top of the building has a yellow crane that moves along a track to transport cargo. The crane has a black chain and hook that lifts cargo from the ground to the upper level warehouse. A gas pump on the side of the building (red and white braided rope with a red plastic nozzle) keeps the accessory construction vehicles fueled for work. The yellow crane that fits on the buildings top tracks is usually missing, as is the black chain attached to it. These two pieces make this 18-piece set (as it is called on the box and in the Dealer catalogues) a 20-piece set. B942A - Lift & Load Depot with a grey base, a large orange "lift arm" on the side, and a white open brick-simulated 2-story building with a green roof on the other side. There is an orange crank-operated bucket conveyor on the side of the orange "arm" that lifts cargo up a slanted ramp on the "arm". The crank moves a yellow lift with a swinging orange bucket up-and-down the lift. The top of the building has a yellow trolley car that snaps into track on top of green roof. The trolley car has an orange crank handle that lifts or lowers a black chain and hook that lifts cargo from the ground to the upper level warehouse. There is a gas pump on the side of the building with a red and white braided rope and a red plastic nozzle. Overall size: 14-7/8" wide x 6-3/8" deep x 10-1/4" tall. *See "Variations" below. FPT1283 - Yellow plastic "cage" / lift that looks like a ski-slope chairlift. Flat "seat" with vertical side bars that come together at top to form a lifting loop. Is open at front and back. FPT777 - Hard plastic, rectangular cargo material "hopper" or lift bucket has small round "handle" that clips into female receivers on the conveyor trolley mechanism. Size: 2-3/4" wide, 2-1/4" deep, and 1" tall. FPT778 - Yellow 1-seat trolley car that attaches to the tracks on top of the #942 base roof. One side of the trolley car has a red/orange hand-crank. When the crank is turned, it lifts and lowers the attached black chain (located under the trolley car). The chain has a black hook on the end to lift accessory cage lifts. FPT269 - 4 each - Brown square simulated wooden plastic shipping pallet that has 2 edges on the bottom sides to allow the fork on a fork lift to slide under the pallet and lift it. The top of the pallet holds a crate and it has an edge to prevent the crate from sliding off. 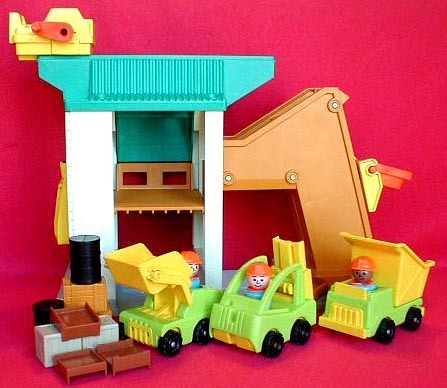 FPT263 - 2 each - Orangish-brown plastic rectanglular crate with no hook on the top. The crate has "wood-slat" sides with 5 verticle "wood boards" on each side and 2 horizontal support "boards" on each side. Has a diagonal mold seam across the top and bottom. Measures 1-1/8" wide, 1-1/8" deep, 1-1/2" tall. 2 each - TPP - Light blue construction worker wearing an orange construction helmet and an orange non-triangular scarf. SPP - Light blue African-American construction worker wearing an orange construction helmet and an orange non-triangular scarf. B942B - Lift & Load Depot with a grey base, a large orange "lift arm" on the side, and a white open brick-simulated 2-story building with a green roof on the other side. There is an orange crank-operated bucket conveyor on the side of the orange "arm" that lifts cargo up a slanted ramp on the "arm". The crank moves a yellow lift with a swinging orange bucket up-and-down the lift...seperate part numbers. The top of the building has a yellow trolley car (seperate part number) that snaps into track on top of green roof. The trolley car has an orange crank handle that lifts or lowers a black chain and hook that lifts cargo from the ground to the upper level warehouse. There is a gas pump on the side of the building with a red and white braided rope and a red plastic nozzle. This part number DOES NOT INCLUDE EITHER the orange lift bucket OR the yellow trolley car with black chain. Those pieces are SEPERATE PART NUMBERS. Overall size: 14-7/8" wide, 6-3/8" deep, and 10-1/4" tall. *See "Variations" below for the base with attached lift bucket and trolley car and chain. FPT779 - Yellow 1-seat trolley car that attaches to the tracks on top of the #942 base roof. One side of the trolley car has a red/orange hand-crank. When the crank is turned, it lifts and lowers a black chain. The chain is often missing or broken. This is a trolley car with NO CHAIN attached. This set was sold in a 15-7/16" long, 6-5/16" wide, and 12-1/16" high box.